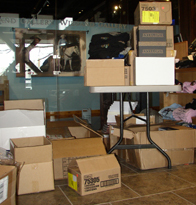 Today is "Moving Day" as the City of Elko assists the Western Folklife Center Gift Shop with moving to the Elko Convention Center as we start setting up our second Gift Shop, full of good things. Last week, there were boxes everywhere, so that is our first photo, although the pile has shrunk considerably. I was lucky enough to get a shot of the first truck as it pulled out from the alley today on its way to the Convention Center. We have an occasional snowflake drifting by this morning so the boxes are covered with blue tarps. And since I had the camera in hand: here are some of our wonderful Elko volunteers assisting with getting the beverage storeroom filled, so that we'll have plenty of libations on hand for the Gathering.